The Achilles Hope & Possibility was scheduled for a 9am start, but there were two waves before the corrals were let out. Ten minutes prior to the start of the race, the horn sounded and the wheelchair and handbikes were able to get an earlier start. Five minutes later, a second horn blew, allowing those with who were injured veterans, handicapped, or had some other physical impairment that would normally impede their running ability. It was at the appointed time that the third horn went off and the corrals were allowed to cross the start line. The race started slow as we tried to find our pace around the guided Achilles runners. 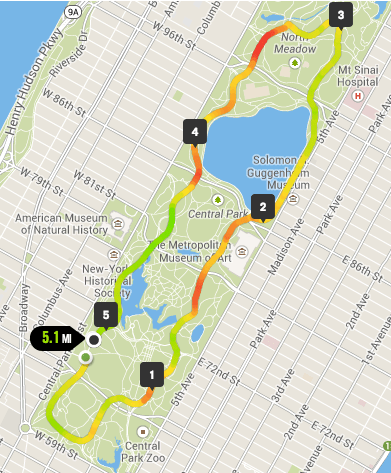 The course started on the west side of Central Park at 67th Street and headed south to the lower loop. We turned left at 60th Street and headed east until the road curved back north and took us to the east side of the park. From there it was a straight run north up the east side, which has some light rolling hills and isn’t a bad run until Cat Hill. A steep run in the hot June morning was rough but everyone seemed to be persevering as we took on the challenge until cresting the hill and savoring the water at the fluid station atop the hill. Turning left and heading west across the 102nd Street transverse was a welcome respite across flat ground until we turned left one more time to head south down the west side. More rolling hills greeted us on our run until reaching the finish line at 70th Street. Although it was only a five mile race, the heat made the Achilles Hope & Possibility a challenging race, but to see all the runners under the Achilles banner was inspiring and was a constant reminder of how lucky we were and how great it was seeing them out on the course. I was able to finish the race in 45:43, a new personal record for a five mile race by almost three minutes, and look forward to the next race and seeing the Achilles runners out on the course.